The colourful lights of Christmas fill the village with a welcoming glow in this festive jigsaw by artist Nicky Boehme. This item measures 61 cm x 83 cm. Available in two-piece counts. 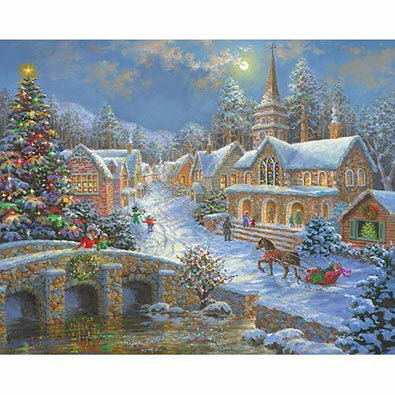 This 1000 piece jigsaw puzzle is designed by artist William Vanderdasson and measure 51cm x 69cm. Available in two piece count. This 1000-piece jigsaw is designed by Joseph Holodook and measures 51 cm x 69 cm. This snow-covered house has been colourfully decorated just in time for Christmas. Available in two-piece counts. This 1500 piece jigsaw is designed by Alan Giana and measures 61cm x 84cm. Available in two piece count.